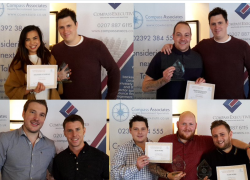 At our end of year conference in December, the Directors wanted to recognise employees within the business who, in their day to day working, display and embody the Compass Associates Core Values. Promotion Congratulations to Carl Dutton! Compass Associates would like to congratulate Carl Dutton on his recent promotion to Acting Divisional Manager. Carl is now responsible for the management and on-going mentoring and development of his own team within the Care Home Division.